Ever since Carmelo Anthony‘s final contract year kicked in, the Oklahoma City Thunder have been in deep financial trouble. And once they signed Raymond Felton for $2.7 million, their luxury tax bill went up to $150 million for the year. Add that to the $150 million in salary that the team will be paying its players, the Thunder were looking at sustaining the most expensive roster in NBA history. And it wasn’t the most expensive because it had the most talent, it was the most expensive because of some horrible contracts. 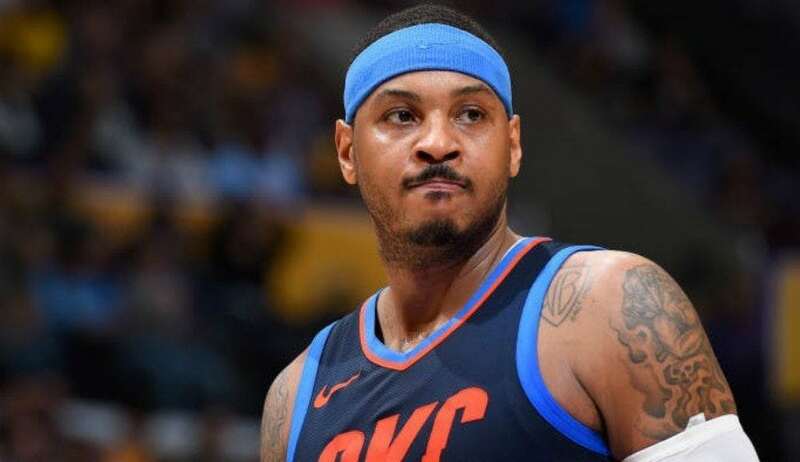 Finance wizards of the Thunder organization had quickly figured out that getting Carmelo Anthony off the roster would help them save almost $116 million in luxury tax payments over the course of the next few years. The coaching staff had also figured out that Melo, with his bad defence and extremely inefficient scoring was not going to help the team in the long run or the short run. So Melo waived his ‘no trade’ clause and the Thunder made him available to potential suitors within the league. The Thunder organization also permitted Melo to meet teams on his own and work out mutually beneficial deals with them. After talks of a buyout and eventual waiving, the Houston Rockets (home to Melo’s close friend Chris Paul) had emerged as the preferred destination. So, reports came out earlier today that Carmelo Anthony has been shipped to the Atlanta Hawks as the part of a three team trade. As a part of the deal, the Hawks sent their starting point guard Dennis Schroder to the Thunder for Melo and a top 14 protected first round pick for 2022. On top of that, the Hawks re-routed forward Mike Muscala from Atlanta to Philadelphia, via Oklahoma City. As a result of this, the OKC will also receive Timothe Luwawu-Cabarrot from Philly, which will also send Justin Anderson to Atlanta to complete the three team deal. OKC’s decision to trade Anthony rather than buy him out wasn’t purely made for financial reasons. The team will save less money by trading his $27.8 million salary away, rather than buying him out and using the stretch provision. However, getting Dennis Schroder will solve one of the most glaring flaws in the Thunder’s offence last season, a tendency to fall off the rails the moment Russell Westbrook sat on the bench. Here are the exact numbers to explain the financial difference between the two situations. If they had bought Melo out and stretched his contract, they would have had to pay $9.6 million to Melo while he plays for some other team. They chose instead to spend a little more and get some on court contribution from Schroder at $15.5 million. Schroder’s move to the Thunder is mutually beneficial. After the Hawks decided to draft rookie sensation Trae Young at point guard this year, Schroder had lost his value on the Hawks roster. On the Thunder however, this young but experienced point guard can bring a lot of offence as Russell Westbrook’s back up off the bench. Schroder averaged a solid 19.4 points and 6.2 assists per game last season. Schroder however, is dealing with some legal action against him based on an incident last September in DeKalb County, Georgia. Schroder and three other men were allegedly involved in a fight with another man, who suffered a torn ACL and meniscus as the result of the scuffle. The initial misdemeanor charge on Schroder has been recommended for an upgradation to felony. The fact that the Thunder have signed on the deal, indicates that the charges will be resolved before the start of the season. So it’d be very realistic to expect Schroder to suit up for the team from the first game. Schroder is a solid and versatile player who can be an extremely valuable reserve. He also only has 3 years and $46.5 million left on his deal, so he can also be a great trade asset in the future. Wade In China : Will the Flash Enter the (Red) Dragon?